When I was a wee lass, I made every effort to recycle paper, plastics and glass, as well as reduce and reuse whenever possible. I thought I was being very responsible when it came to being eco-conscious. As I grew older, I realized there was so much more that I could do. It wasn't until I met my husband and we had children that my outlook towards the environment changed drastically. The biggest change centred around cleaning products, namely those that had a harsh, chemical smell. I'm pretty sure my sense of smell became more heightened post-pregnancy, but I like to think it was my body's way of saying that I needed to be extra cautious when it came to exposing my children to potentially harmful products. This is why I am grateful for brands like Seventh Generation. 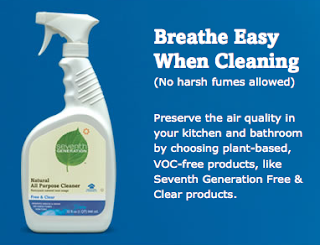 Seventh Generation has been on a mission to help protect the environment with naturally safe and effective household cleaning and personal care products for over two decades. For review, Seventh Generation sent me coupons redeemable towards some of these products. I opted for the new fragrance-free Automatic Dishwasher Gel, a Natural Kitchen Cleaner in wild orange and cedar spice, and the Free and Clear Liquid Fabric Softener. I've used the dishwasher gel in lemon in the past as well as their laundry detergent whenever I find them on sale. They are non toxic and chlorine free which makes me feel more at ease when using them regularly on the kids' clothes and such. The natural kitchen cleaner is also biodegradable, an added bonus. I am glad that they have fragrance-free products, although I really like the scent of the wild orange and cedar spice kitchen cleaner. And it is also nice to see that some of their products, like their dishwasher gel, come in bottles made with 90% Postconsumer Resin. Seventh Generation also discloses their full ingredients list on their packaging along with a little break down of select active ingredients and their function. If you want access to coupons, special offers and great tips for green and healthy living, join the 7th Gen Nation today. And while you're here, don't forget to enter to win a Seventh Generation gift pack. One Canadian reader will win a Seventh Generation Gift Pack that includes: an Seventh Gen Eco lunch bag with FREE coupons for Seventh Generation’s Free & Clear Diapers, Free & Clear Baby Wipes, Natural Household Cleaner and one of their Dishwashing and Laundry products. You may enter using the Rafflecopter form below. My best tip would have to be recycle as much as you can... my kids are very involved in it..And also ditch the water bottles and buy one you can reuse!! My best tip is to choose products that can be reused (clothes rather than paper towels when possible) and choose products with little or less packaging. my tip: repurpose as much as possible! by breathing new life into something with a little creativity, it keeps it out of the landfill! if you can't use something anymore, donate it! Aside from the usual composting and reusing, I also belong to recycle groups and we look for people that could use our gently used items. We recycle every possible thing that we can, paper, tin, glass and plastic. Using water collected in a rain barrel to water your plants makes you more environmentally conscious. My best tip would be to recylce all those water bottles,drink cans,juice packs,etc.,.! Also hang clothes on the line to dry whenever possible! I have invested in a good quality reusable lunch bag, containers, utensils and drink container - I have saved a lot of plastic waste! Know where your food is coming from and how it gets to your table (how it's grown, where it's from, etc) plus try to buy things with the least amount of packaging!